By Hayden Shearman // Injury, illness, fatigue, life stress, niggles … there are many perfectly valid reasons to skip a scheduled run. But there are also plenty of times when we just need to swallow a concrete pill, harden up and get the thing done. So how do you know which is which? Should I run or I is my body screaming out for a break? Right from the outset I should note that I’m not a doctor and the best course of action is always to check with your doctor first. 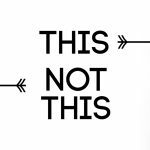 But my golden rule around colds and flus is that if it’s just in the head (blocked nose and headache) then you should be okay to do an easy-paced run of a short to moderate distance. You might even find the run helps clear you up. However, if the sickness is in the chest and/or you’re running hot with a fever, it will pay to take a rest day or two. And if there are extreme weather conditions (like heavy rain, cold temperatures, high humidity or high temperatures) then this will further influence your decision to take more caution with your decision to run. Also consider how important your training run is. If you’re three weeks out from race day, I’d probably be more disciplined about getting the run done and looking after myself as best I could. But if you’re five months out from the race? Not such a biggie if you miss a run or two. It’s good to get in the habit of rating your niggles on a pain scale of 0 to 10 (zero being non-existent and 10 being excruciating to the point of blacking out i.e. childbirth—not that I would know what that’s exactly like but my wife assures me it’s worth than man flu). 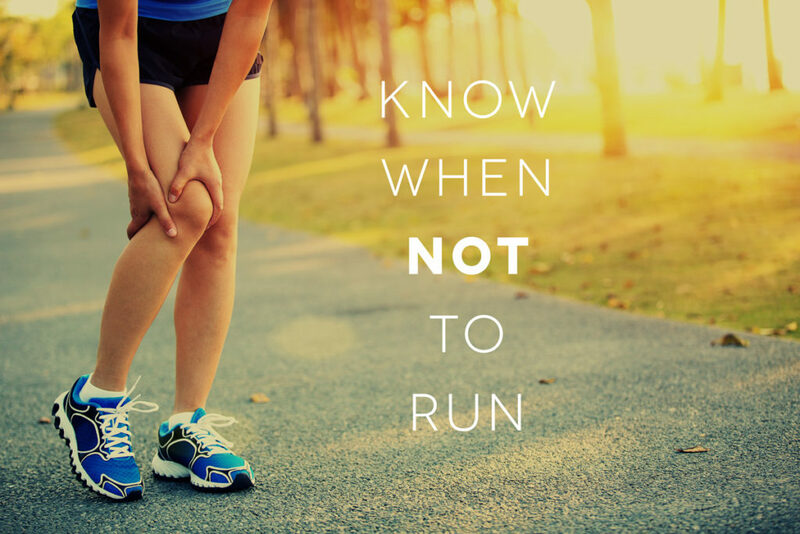 You might start a run with a 1 out of 10 niggle in your knee that builds up to a 3 after 10 minutes of running, before fading to zero once fully warmed up. Take note of these patterns and even write them down. 1-3 out of 10 niggle that disappears once warmed up during running. This should be okay to run on but you should be careful when increasing mileage and/or intensity. It’s also a good plan to introduce some strengthening/mobility to address imbalances. Racing is usually okay but it doesn’t hurt to check with a medical professional first. 4 or more pain that disappears once warmed up. This needs physio attention and most likely a reduction in training. Race with caution and get medical advice. Consistent 1-3 pain that doesn’t go away when warmed up. Again, seek physio advice to manage this pain and to hunt out the root cause. You should be able to continue running through treatment but you will need to avoid too much volume or intensity, consider cross training options. Race with caution and get medical advice. Consistent pain of 4 or more. Don’t run on this. Book in to see your physio ASAP. Unless you’re running your first and only Olympics, absolutely no racing. As a little guide, I consider a 3-out-of-10 pain to be one that is just starting to influence your running form. There might be a slight hobble or favouring of one leg. 1 or 2 there is no noticeable change to running form, it’s kinda like how you’d run if your socks were slipping down inside your shoe: aware of a mild discomfort. 4 or 5 pain and you’re almost always aware of pain every step and you’re being very cautious about foot placements and avoiding sudden exertions. Others are asking if you’re okay and you catch yourself grimacing in the reflection of shop windows. 6 or more and you’re walking/hobbling/hitch hiking home wondering if you can get a refund on all your race entries. Sometimes outside influences like work deadlines or a hectic household can make running a real chore. And the reality is that running training is another kind of stress that you’re adding to this already chaotic mix of mental and physical strain. So is it worthwhile getting out for a run when the kids are misbehaving, the cat has puked on the new sofa, bills are overdue and you’re generally behind the eight ball on everything? Personally, these are the times when a run—any sort of run, no matter how short—is exactly what the doctor ordered. 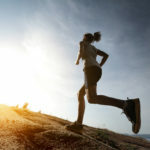 Even if it’s just 15 minutes, perhaps with some quick bursts of faster running, this chance to focus on you and improve your mental wellness by releasing some positive hormones will almost certainly make those other stressors more bearable. However, in these busy times, remove any unrealistic expectations for doing three-hour runs followed by 30-minute stretch sessions and a perfectly Instagram-able recovery smoothie. Just chuck on an old t-shirt and shorts, head out the door and run for as long or as short as you can, have a quick shower and take a moment to appreciate your health and the clean air you breath, and then carry on to deal to the chaos! This is a series of blogs all about getting you trained up and raring to go for the 2017 Lion Foundation Rotorua Marathon (or half or quarter). Grab a fully personalised and tailored training plan to take you to your next race. This entry was posted in Training Tips, Uncategorised and tagged mental health, mental toughness, Rotorua Marathon, running injuries, running when sick. Bookmark the permalink.